Influencer marketing is about growing your audience and leveraging the voice of well-connected people … but using influencers with the biggest audiences isn’t always the answer. CCO: What is micro-influencer marketing? Burns: Our micro-influencer program seeks superfans of Tom’s of Maine. These are not people who charge money or make a career out of influencer marketing; they are real people who enjoy the opportunity to engage with our brands. We’ve created a community for them, and then we share content and tell them that if they like it, they can share it with their followers. Because it’s not transactional (i.e., they are not paid), it feels very genuine. CCO: How did you build the influencer program? Burns: When we began experimenting with influencer marketing using tools like SheSpeaks and Klout, we noticed spikes in our online share of voice for the length of the program … then it would go back down to normal. Our agency team came up with the idea of creating what we call a Goodness Circle. It’s a year-round program with a dozen bloggers; we contract them to write a certain number of posts about our brand each year. We sometimes feature their content on our channels, and we co-host monthly Twitter parties with them on various subjects related to our brand. The launch of The Goodness Circle was a success, but its impact is limited because our budget only allows for a certain number of bloggers. We started to consider how we could replicate the success of the program at scale. Someone from Mavrck, a micro-influencer marketing platform, contacted me while we were wrestling with this problem. It was the perfect fit for our needs. Basically, we took that same idea of sustaining our share of voice metric, but extended it to a much larger scale using a micro-influencer model. CCO: How does the community influencer program work? Burns: Mavrck hosts the community and members log in through their Facebook page. We recruited our members via our social media channels and email campaigns – our first members were all Facebook fans. Because we have access to that Facebook data, we can group our micro-influencers by geography. Then we may ask them to visit the local Wegmans and find our display. We can also ask them to take surveys to further segment them into audience groups; for example, we may ask an influencer whether she has children and their ages. That way we can send content to share that’s specific to her children’s development. We do not pay micro-influencers, but do offer product and brand-related rewards through the Mavrck platform. Right now, we have over 20,000 micro-influencers. The total reach from that community is 19 million. We’ve opened our community to anyone who’s interested, but we rank our members by influence level. It’s not about who has the most friends, but those whose friends are most likely to react when they post something on Facebook. CCO: What motivates your micro-influencers to maintain the relationship with your brand? Burns: We’ve worked to recruit community members who have a genuine interest in the products we offer. Beyond that, we strive to provide the community with content that is valuable to them. For example, they may be first to hear about a sale at Target or first to share articles from our blog that give tips on living a more sustainable lifestyle. We also give our community members rewards like Tom’s of Maine gear. Sometimes we even use them as a sounding board for ideas. I think knowing they can influence not just their friends, but also Tom’s of Maine as a brand, is pretty motivating. 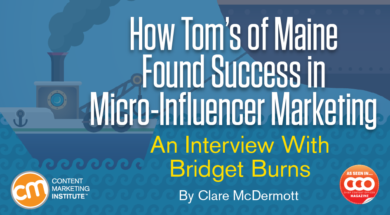 Bridget’s experience at Tom’s of Maine is a great example of going beyond the traditional or big-audience influencers. Celebrities and highly visible social influencers may shine a spotlight of attention on your brand, but they can also invite problems. (To say nothing of the higher cost of these types of programs.) Any small scandal a celebrity influencer may find him or herself in can cast a shadow on your brand. And marketers sometimes find themselves paying for social influencers with tens of thousands of followers … only to find out many of those followers are fakes. As with any influencer program, close monitoring of influencer behavior online, as well as sentiment analysis related to your chosen brand activists, is key. What are the risks of engaging micro-influencers? Scandals and fake followers aren’t problems in the micro-influencer universe, but it’s critical to maintain an open line of communication with your micros. Micro-influencers are paid very little, if at all, meaning discontented influencers won’t likely feel a barrier to turning on your brand if they feel they aren’t being heard. Set up clear and direct communication pathways to resolve complaints and respond to suggestions. And, above all, build a sustained relationship with your micro-influencers to ensure that their voices are authentically enthusiastic about your brand. Whether you want to address a micro or a macro issue of content marketing, make plans today to attend Content Marketing World 2018. Registration is open – sign up today.